Sentence of the Day- "Hello, My Name Is...."
Katy's First Day of Kindergarten!! Wordless Wednesday- Back to School Haircut! 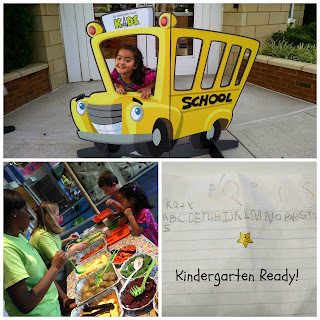 Discovery Place Kids- Countdown to Kindergarten! We were sitting around the dinner table this evening, asking Katy how her day went. Katy was talking about her table-mates (Her class sits at tables of five or six students, opposed to individual desks). Specifically, she was talking about one little girl that sits beside her. In an effort to learn more about Katy's new world at Kindergarten, Ted interjected and asked Katy what her new friend's name was. Seriously and straight-faced, she answered, "I don't know. That's not her name- 'I don't know.' I guess I'll have to ask her tomorrow." She didn't even crack a smile at her own joke/play on words. Ted and I, on the other hand, just about died of laughter! Hahaha...! 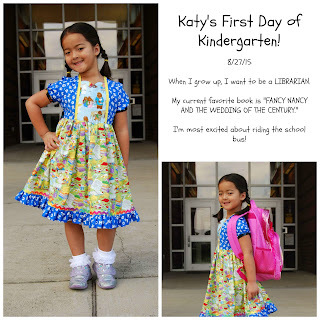 Today was Katy's first day of kindergarten. 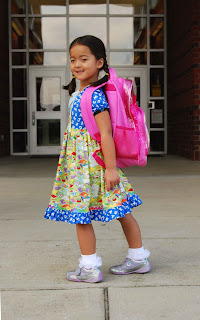 It was her first "real" day of school adventures, memories and the start of a lifetime filled with learning. It was her first day- the precipice of something new and (hopefully!) exciting! She was so confident and excited boarding the big, yellow school bus- just like a big kid! The world is her stage and she is ready to charge full-speed ahead! She is ready; So ready! She is so smart and so perceptive! Her mind is hungry and fertile for learning. Her vocabulary, alone, rivals that of some adults- truly! I cannot wait to see and bear witness to all of the growth and development that will most-assuredly occur over the course of the next ten months. Today was my first day, too, though. 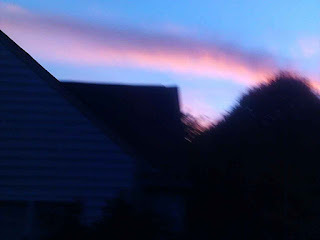 You see, it was my first day of the beginning of learning to let go.... Of giving up complete control and handing her off to multiple capable hands.... Of depending on others for the fate of my daughter- our one precious possession that was never really our's to keep in the first place... Faces and names that I have not yet met, let alone carefully screened, observed and/or observed..! All in the name of creating a whole village of learning. Life lessons, book learning and everything in between. Five and a half short years- gone in the blink of an eye! Yet, so much pure, raw love, effort, sacrifice and HARD WORK to get us to this point in time. Oh, those long, sleepless nights...! Lost sleep is just the beginning, though... I fear- nay, I'm am SURE!- that there will be more sleepless nights in the future as Katy grows up and hits each tangible and intangible milestone. Her first sleepover, learning to drive, first date, first heartbreak, college and God willing, marriage, babies and more!! Five and a half short years to pump everything possible into our little girl to make sure that she is ready to meet and greet the big, wide world. A world that isn't always kind. A world that isn't always nice. A world that may teach my child about subjects that I may not necessarily want her delving into (right now- or ever!). A world that doesn't always make sense- even to my adult self, let alone a child! Five and a half years short years to be her first and primary teacher. 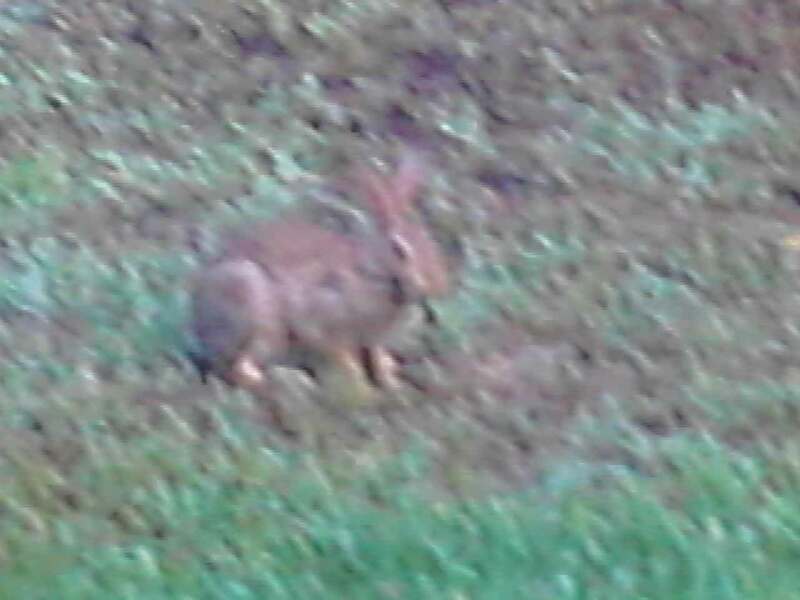 Manners, social graces, playing nicely with others... Respect and kindness... Letters, colors, numbers and words.... Books, books, books and more books....! Teach them young. Be consistent. Teach your child your family's values, or the world will do it for you. 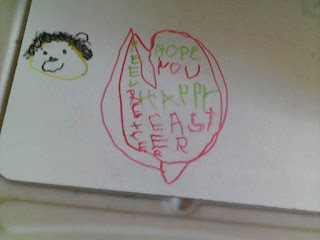 Five and a half years to go from helpless infant to strong, confidant Kindergartener; ready to meet the challenges ahead! What if she struggles to fully understand an academic concept? What about bullies? How will she handle the long school days? Homework- how will I deal with homework in our seemingly, already full schedule? Five and a half years and a million and one emotions tumbling around inside me. 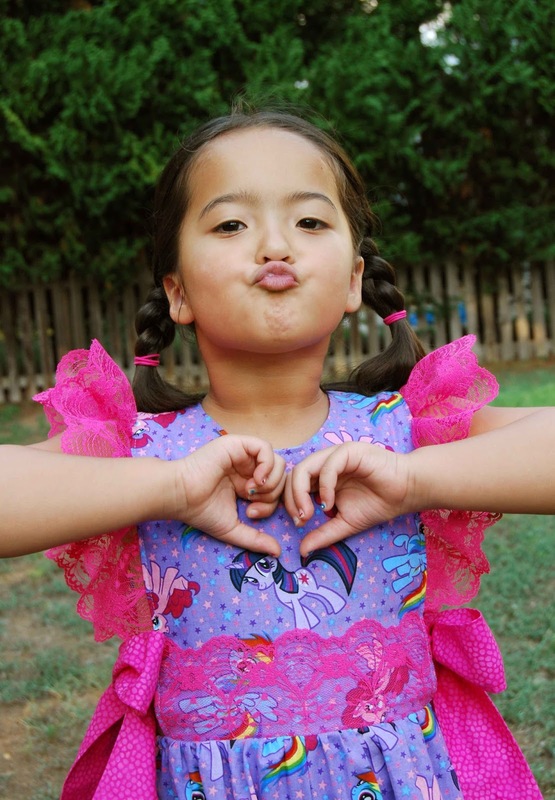 Blogger Mama by the Bay says it best in here post, "Dear New Kindergarten Mom." Look out, World, here comes our beautiful, kind, intelligent, strong Katy Grace!! May she be mighty and kind, empathetic and perceptive. May she be hungry for knowledge, and thirsty for more. More trips to the library and less trips down the road of doubt and worry. Never be afraid to learn more (New subject, New concept, New hairstyles or trends). May she be strong enough to stand up for what she believes, yet intuitive enough to know when to back down. There is a time and a place to be right. There is also a time and a place to be kind and graceful. May she feel loved and be love. May she be the hands and feet of Jesus to those who need it most. May she never forget or lose sight of what is important. Faith is important. Love is important. Always. May she always know that her father and I will always have her back. Also, know that we will never stop worrying and loving her. Late nights, difficult days... We.are.family. May she have a reason to get dressed up and feel beautiful both inside and out. Beautiful for who she is, not what the world dictates. Yet, still not be afraid to get her hands dirty- To work with her hands, to create beauty and see the beauty in the world around her. May she ask more of herself and more of those around her. She is worth it. May she not be afraid to say, "No." May she not hesitate to say, "Yes!" Yes to opportunity, yes to friendship, fellowship and love. 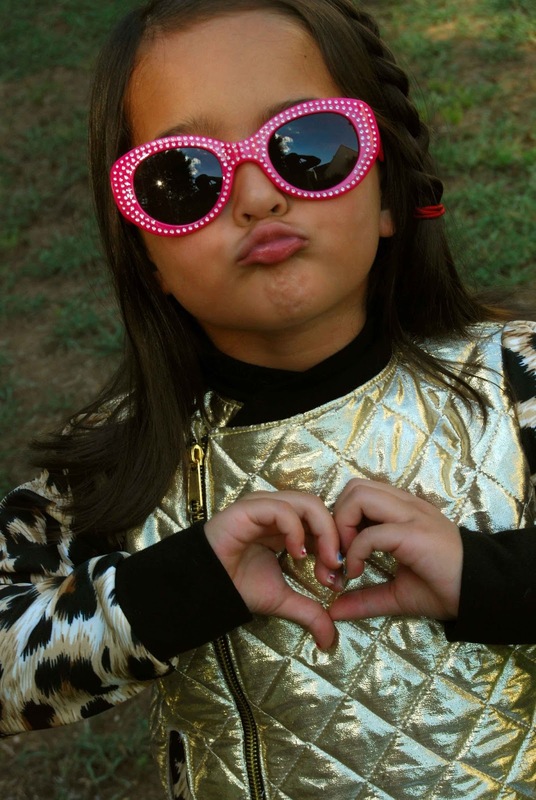 May she remember where she came from- that she will always be our little girl. 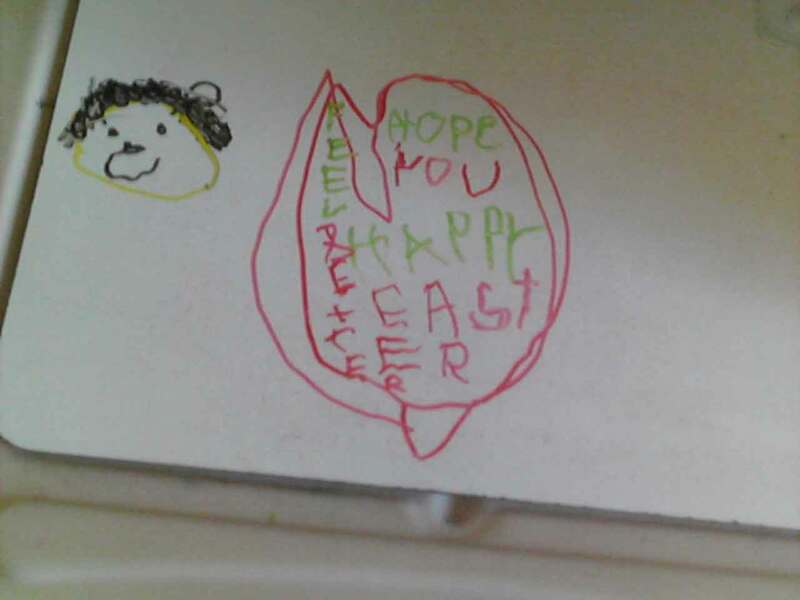 May she be hopeful and expectant of her future. Work for it, Girlie- it's your's for the taking! Happy, excited, sad, hopeful and afraid.... Today marks the beginning of our family's next chapter in life. Look out Kindergarten, here comes Katy!! 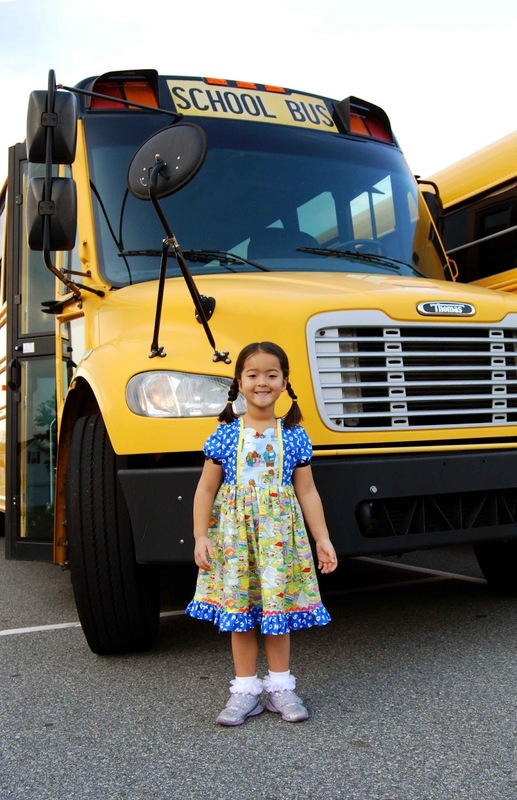 Lil' Miss is beyond thrilled to start elementary school and she is so excited to become a "big kid" and ride the school bus. She was assigned to Mrs. Mitchell's class. Katy will also have a student teacher, Ms. Hardister. Their classroom 'theme animal' is the zebra. "The wheels on the bus go round and round..."
Several weekends ago, we went to Target to purchase a pink, sparkly Barbie backpack. Originally, I had wanted to buy her one online, but Lil' Miss insisted on going to the store, "...for the experience..." of selecting her own special backpack. Hee, hee, hee.... only Katy! Sporting her new sparkly pink Barbie backpack! She may not fully understand all that is to come, but she's ready for the adventure of something new! She knows her letters, she knows her colors; she's ready to learn more! Soooo....! Here's to a great start to Katy's road to learning! Cheers to untapped potential and discovering all that there is to learn! Here's to reading, writing and arithmetic! I can't wait to see what the future holds for our daughter! Lil' Miss may look like her mama, but she's a Daddy's girl at heart! So, when I saw the newest pattern, Daddy's Girl dress, designed by Cassie Massolia for Little Lizard King, I knew that I just had to sew it up! Hubby has worn button down, dress shirts for the majority of his career. That means that in the 10+ years that we've been married, he's gone through quite a lot of shirts!! There was a period of time that he kept getting a hole in the same spot, on the elbow. Perfectly good, wearable shirts- but with a hole in an un-fixable place!! 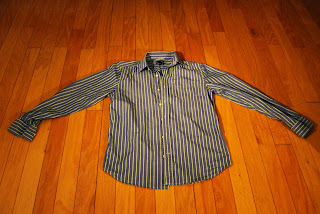 I've saved these shirt (Admit it, you've all seen those Pinterest upcycles using a man's dress shirt! ;-) but I've never quite gotten around to actually MAKING anything out of those old shirts...! Well, no more... 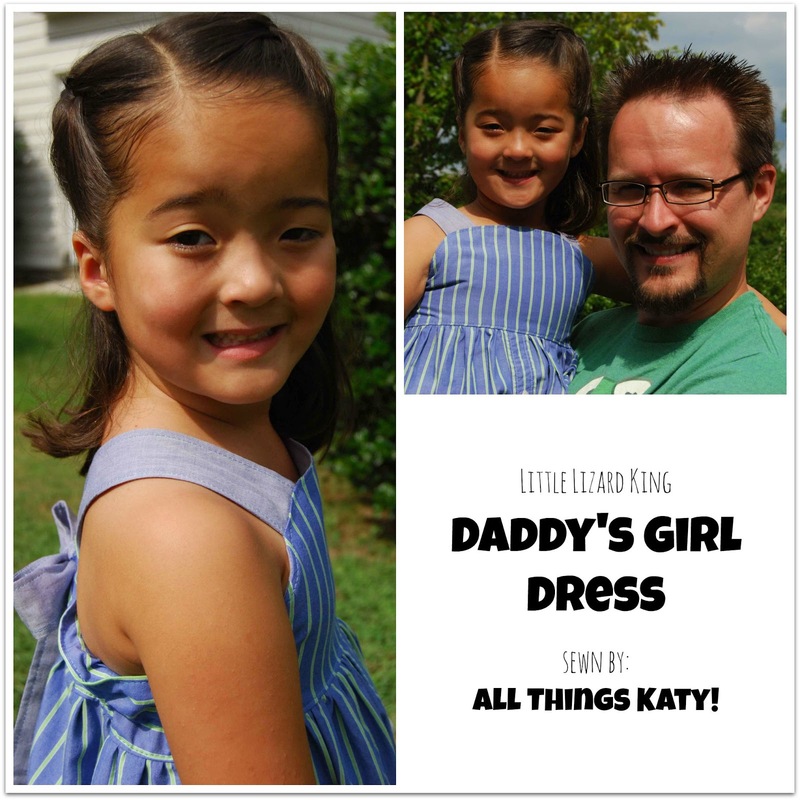 Introducing, the Daddy's Girl dress!! 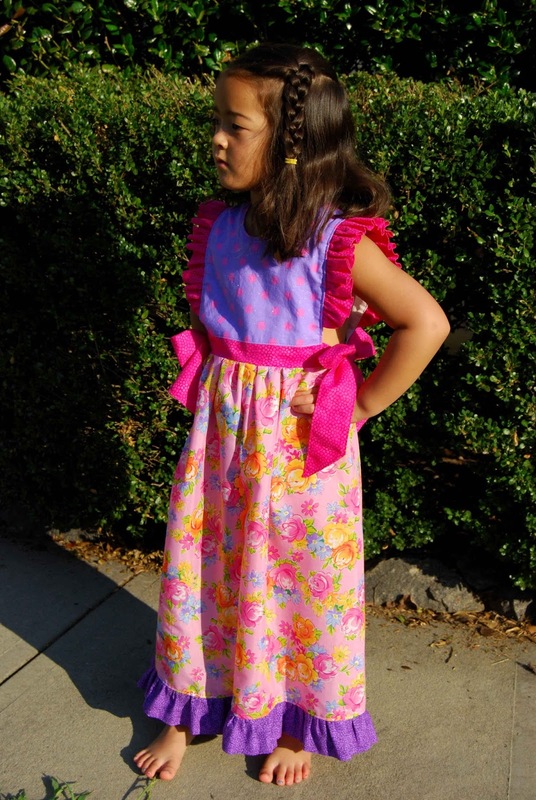 -The Daddy's Girl dress is sized for 12m-14y. 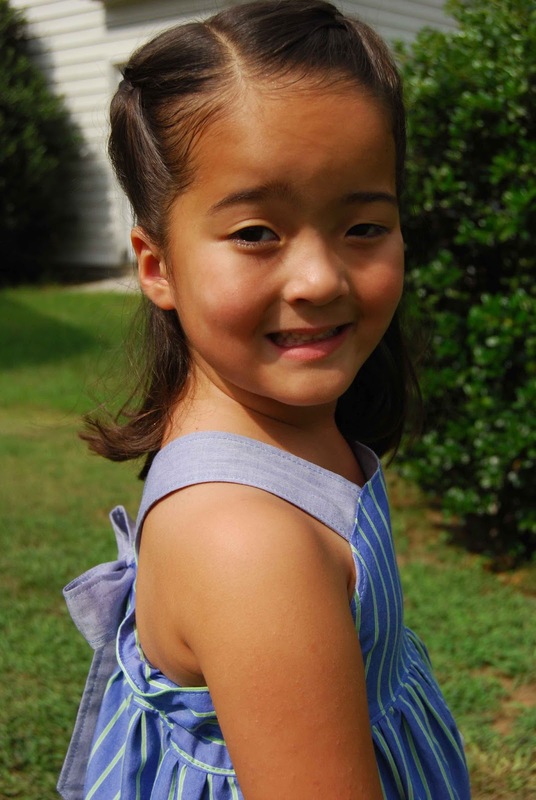 -The Daddy's Girl dress features a curved front bodice, elastic back and tie shoulder straps. -The Daddy's Girl dress can be made using a dress shirt OR fabric. -The Daddy's Girl dress PDF sewing pattern includes pattern layers- just print the size that you need/want (one of my favorite features in a pattern!). 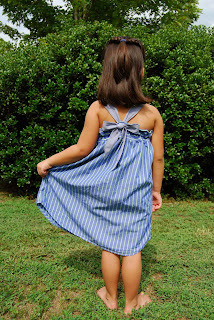 -The Daddy's Girl dress PDF sewing pattern includes a cutting chart, size chart, fabric requirements and elastic cutting chart. 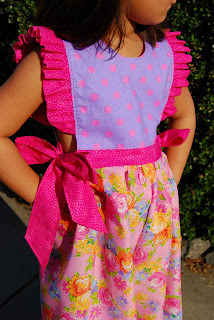 -The Daddy's Girl dress PDF sewing pattern features step-by-step photographs. 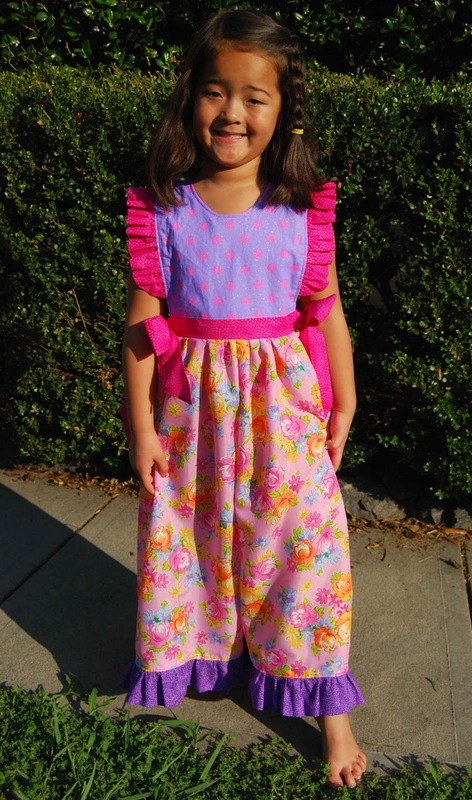 -The Daddy's Girl dress includes optional in-seam pockets and button placket (if using the fabric option). 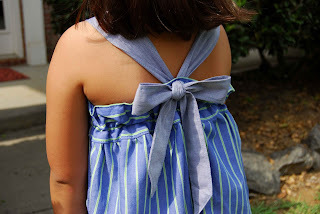 I did modify the pattern slightly by lengthening my shoulder straps by a couple of inches (so that I could have the option of tying a neat bow, in addition to the tie instructions included in the pattern) and angling the shoulder straps ends. Since I used an existing button down shirt there was no hemming involved! Love.That! Seriously, this dress probably took me 30 mins to sew up! So simple, sweet! The Daddy's Girl dress PDF sewing pattern could easily be sewn up by a beginner sewist. With it's very detailed directions on how to lay out the pattern (when using an existing dress shirt), everybody is sure to get a great result! I love that the The Daddy's Girl dress uses an existing shirt and makes it new. This is the perfect pattern for creating a special keepsake, or sentimental piece. Speaking of Italian, let me introduce you to PDF sewing pattern designer, Love Notions latest creation, La Bella Donna Top and Tunic. "La Bella Donna" translates to "The Beautiful Woman," and let me assure you that I feel very stylish in my new creation! La Bella Donna top and tunic is jam-packed with options! -La Bella Donna is sized for XS-XXXL. -La Bella Donna can be made in short sleeve or long. 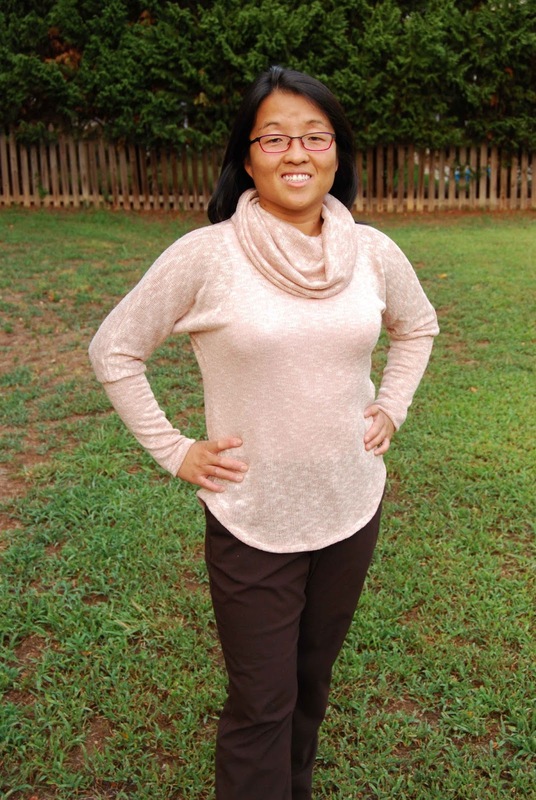 -La Bella Donna can be sewn in shirt length or tunic length. 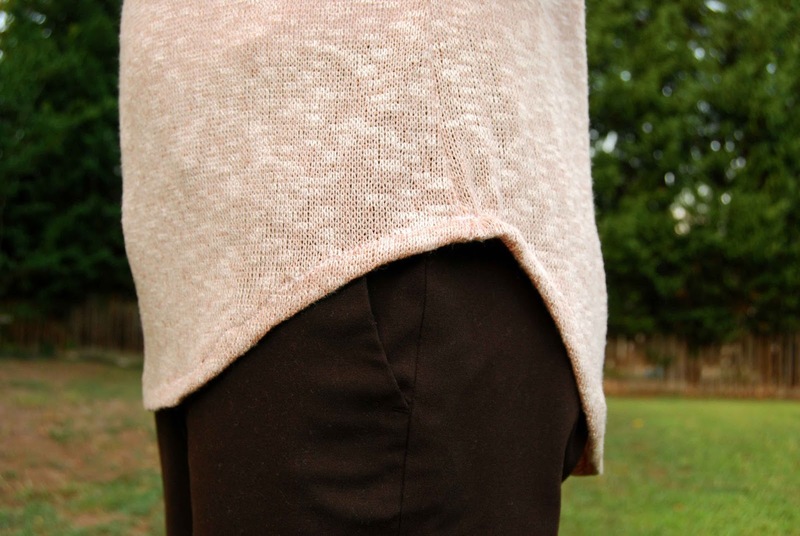 -La Bella Donna features a slight dolman style sleeve. -La Bella Donna includes optional neck band and hem band. -La Bella Donna includes pattern pieces for a cowl neckline. 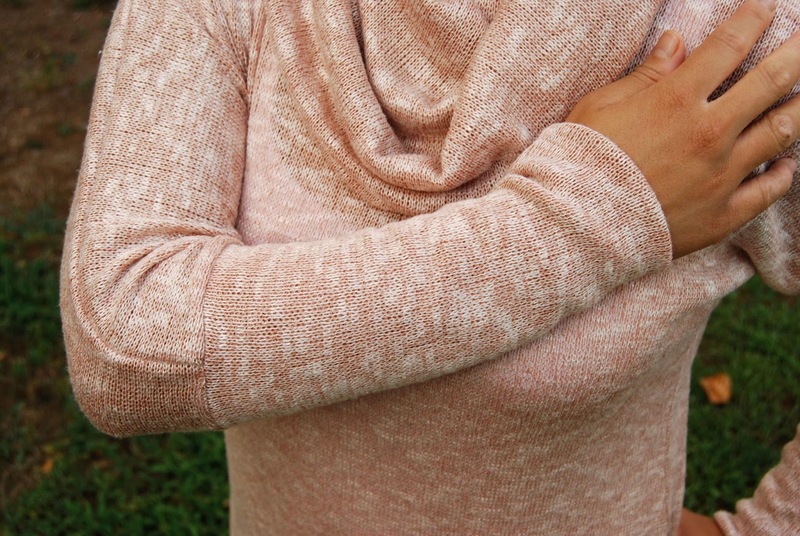 -La Bella Donna also includes a hood pattern piece/directions. -La Bella Donna PDF sewing pattern includes a size chart, printing guide, page layout, and fabric requirements chart. -La Bella Donna is best sewn using medium-weight knits with good stretch. 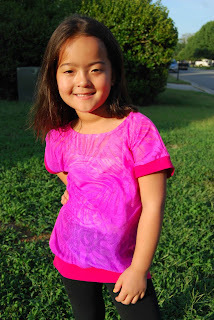 After consulting the sizing chart, I sewed up a size small. I used value sweater knit from my local Hancock fabrics in a soft, peachy color. 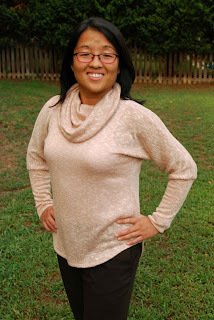 I sewed long sleeves and cowl neckline. I kept the curved, shirt-tail hem of the pattern pieces (opposed to the optional hemband). Also, I slightly modified the pattern by eliminating an inch in length since I'm only five feet tall (at least that is what my driver's licence states ;-). The pattern is sized for the average 5'-5" woman. Because La Bella Donna top and tunic doesn't have a separate sleeve pattern piece (the distinguishing feature in a dolman-style top), there are really only four major seams to sew- shoulders and sides. Any added pattern options will take a bit longer, but I'll be honest, this pattern did not take me all that long to sew up! I even surprised myself with the abbreviated work time! 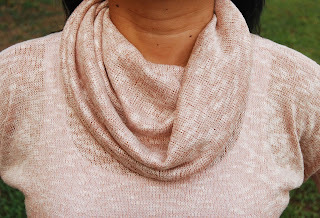 Before sewing up this version of La Bella Donna, I had never sewn with sweater knits, before. However, when I saw that gorgeous cowl option, I knew that I just had to give it a try. I was a little nervous to start, but all I did was serge away and remember not to stretch my fabric while sewing. Some might even say that working with sweater knits is SEW easy.... hahahaha! La Bella Donna is my favorite article of clothing that I have made myself, to date. The cut of the top is flattering and the styling is on trend. 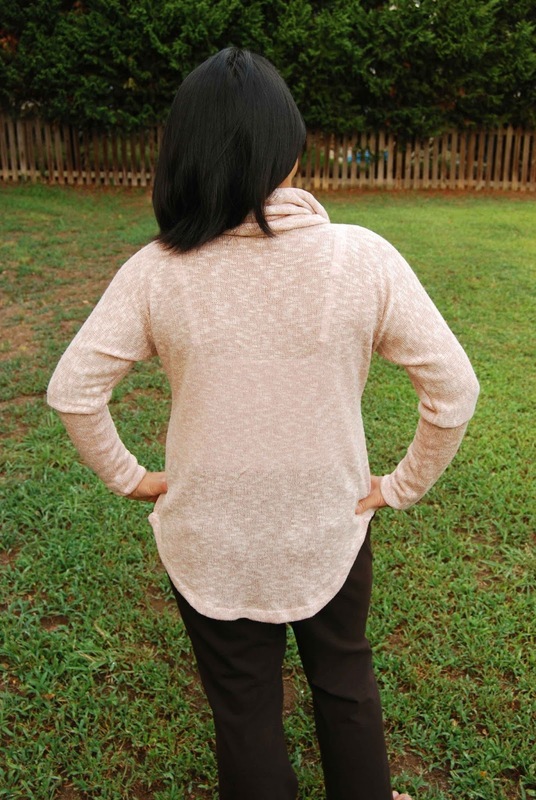 I love the versatility of this pattern as it can be sewn up in short sleeves for warmer months and sweater knit for the winter. I can always appreciate a pattern that can take me through the whole year! Thank you, Tami (the brains and "La Bella Donna" behind Love Notions), for allowing me to test your latest and greatest pattern, La Bella Donna. I see many more of these in my closet. I love it! That's not all, though.... Guess what? 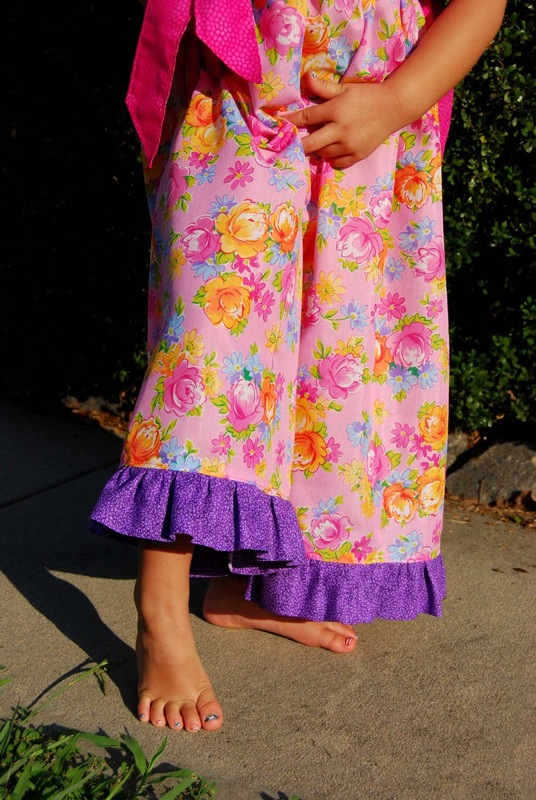 The Love Notions La Bella Donna also comes in girl's sizes, too!! How fun is that?!?! 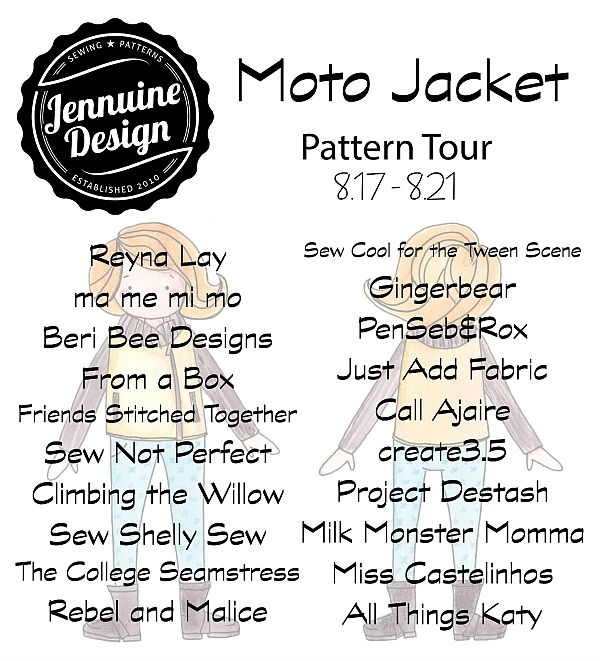 Hello and welcome to the Jennuine Design Moto Jacket Blog Tour! It may still only be August here in the South, but school is almost back in session and fall fashion in on the horizon! With cooler temps (yes, please- as I sit here sweltering in 90+ degrees! 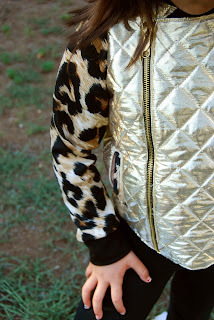 ), comes jacket season! 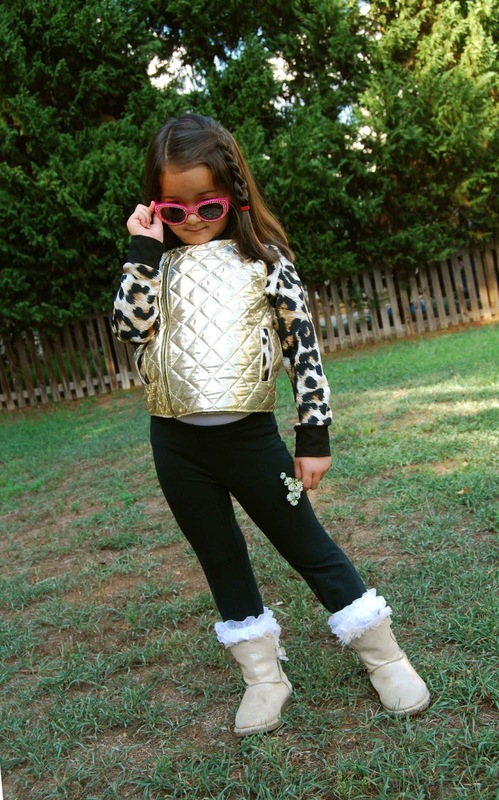 I don't know about you, but as a mother, I struggle to get my five year old daughter to wear a jacket- even when it's downright cold outside! She hates to be bothered with it; it's a hassle to get on and off. Most of all, though, my little fashionista complains that winter jackets are (and I quote), "...too poofy!" 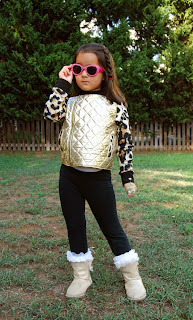 In short, jackets just don't jive with her style....! Ha! 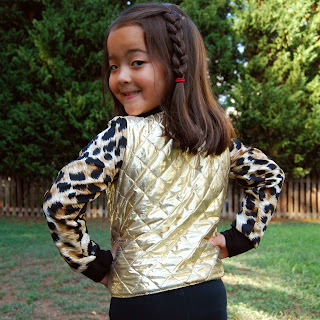 -The Moto Jacket is written for sizes 2t-12y. -The Moto Jacket includes shaded illustrations and diagrams for each step, opposed to photographs. -The Moto Jacket PDF sewing pattern includes a sizing, fabric requirements, finished measurements charts. 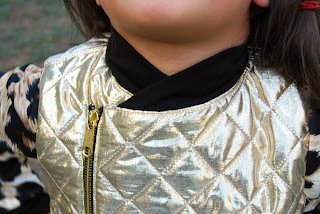 -The Moto Jacket PDF sewing pattern includes trimless, layered pattern pieces- LOVE, love, LOVE that!! -The Moto Jacket is written for knit sleeves and welts and wovens for body (heavy) and lining. -A glossary of terms, instructions on how to shorten a zipper and other tips along the way are also included in the The Moto Jacket PDF sewing pattern. I sewed up a size 6 Moto Jacket. The black four-way stretch cotton lycra was purchased online from the Purpleseamstress Fabrics. All other supplies were purchased locally at Hancock Fabrics. When I saw that quilted gold lame fabric on the clearance table, I knew it would make the perfect jacket! 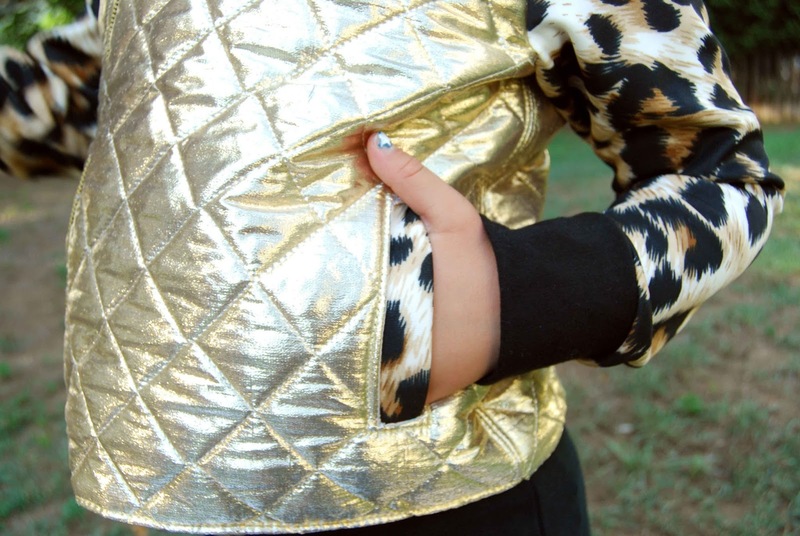 Paired with animal-print ponte knit for the sleeves and- roar!- a winning combination!! 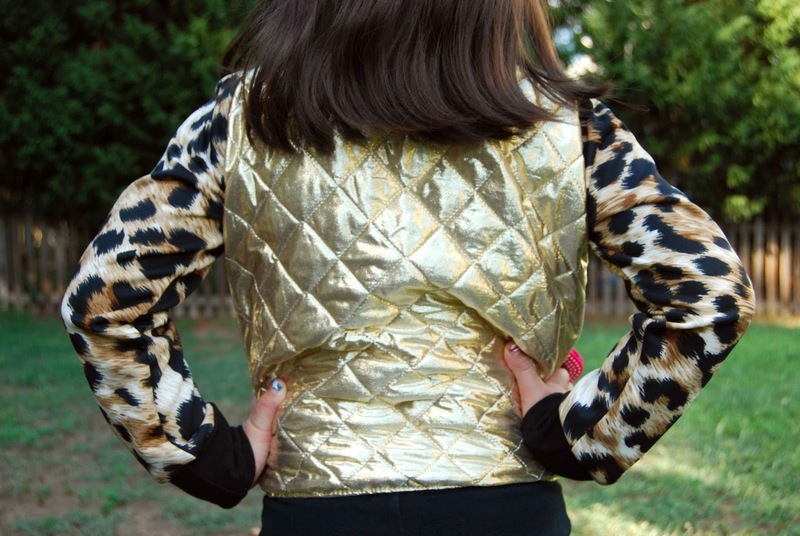 Moto Jacket by Jennuine Design- So much sass! Now, before I go any further, I want to admit that I cut out front jacket pieces backwards. 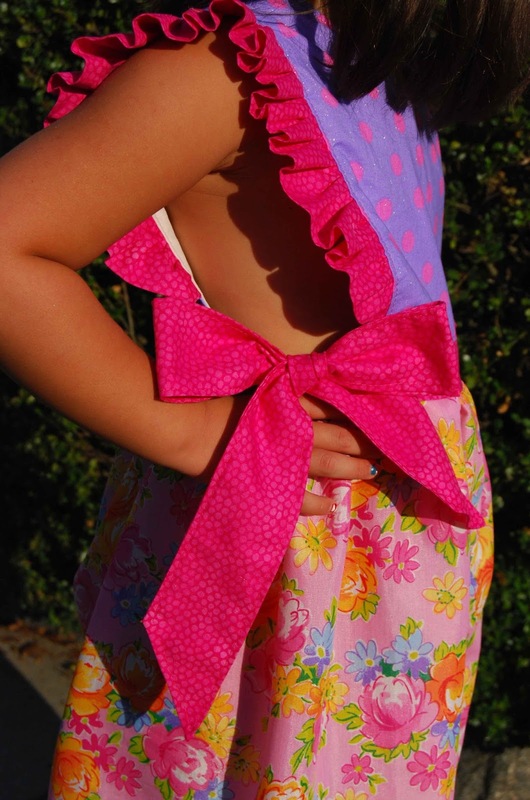 The girl's version should have the zipper of the WEARER'S left (I got confused when cutting and didn't reverse the pattern pieces when I laid them down on the fabric and cut). This is definitely operator error- not the fault of the pattern. So, note to self- and other's just venturing out to make a Moto Jacket of their own- when cutting out main jacket pieces for the Moto Jacket, make sure that you cut according to the WEARER'S left (girl) or right (boy). This is the first actual jacket that I've ever made. In the past I've made some light-weight blazers and such, but nothing as involved as a jacket- complete with zipper and lining. The Moto Jacket was my attempt at a real, live jacket! I'm happy to report, it was a success! 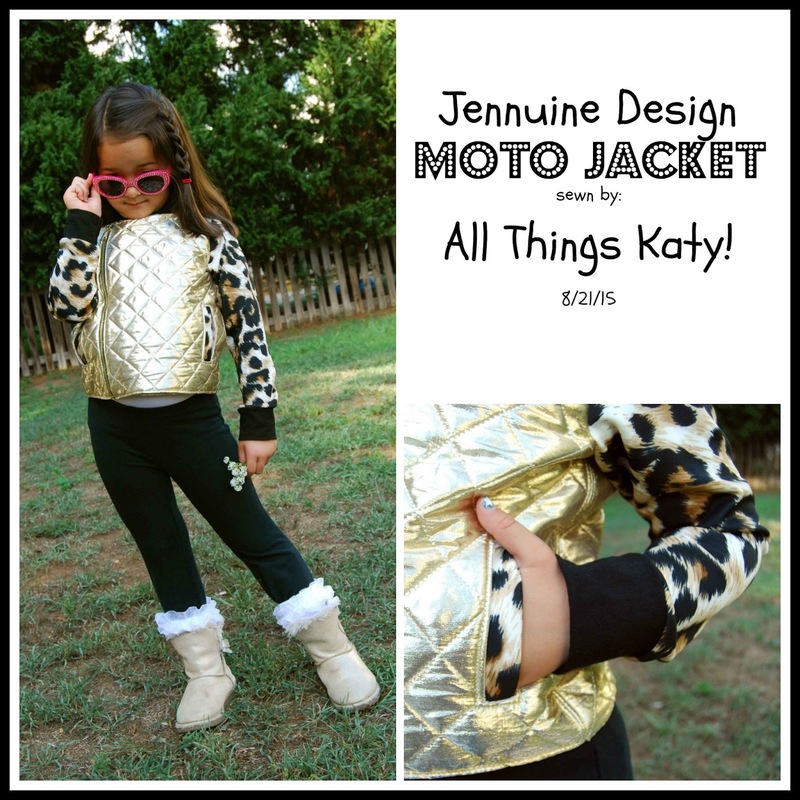 The Moto Jacket was my first introduction to Jennuine Design PDF sewing patterns. Instructions were easy to follow and simply laid out. The flow was fluid and the shaded illustrations and diagrams were helpful. I love when a pattern is layered and I only need to print out the size that I need. I didn't hesitate at any step and I never questioned what I should do next. #Winner! 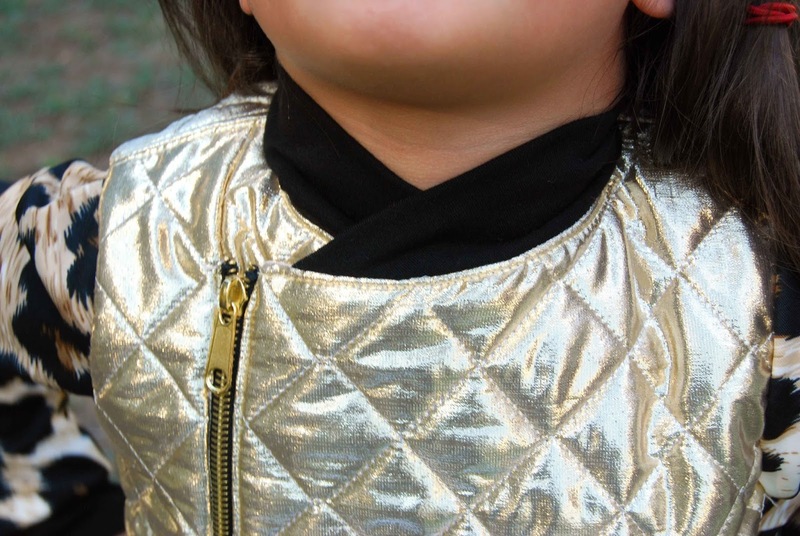 I made the Moto Jacket with lightweight quilted gold lame and ponte knit. I used lightweight lining material for the inside. This resulted in a medium-weight jacket. However, depending on your material choices, you could make the Moto Jacket lighter or heavier-weight. It sparkles! It's unique! It's tres chic! Lil' Miss LOVES her new Moto Jacket!! Thank you, Jennifer (the brains and talent behind Jennuine Design), for allowing me to review the Moto Jacket! I thoroughly enjoyed my introduction to Jennuine Design. 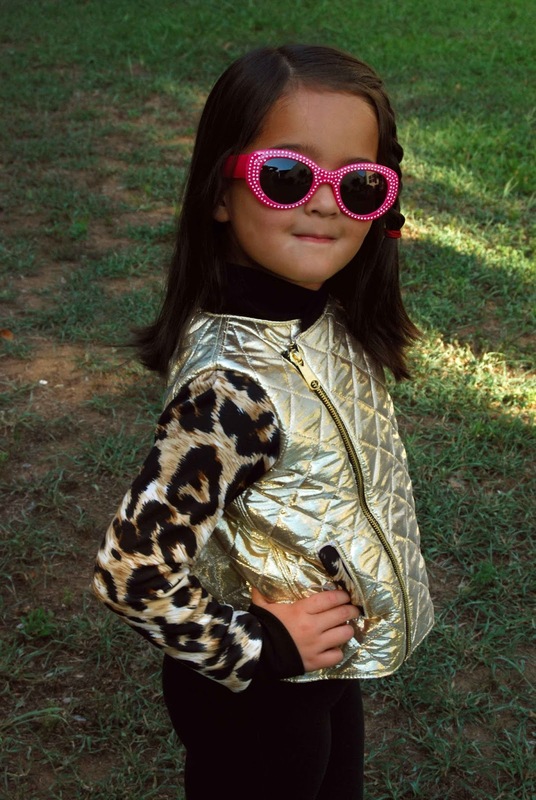 Best of all, Lil' Miss LOVES her new jacket and *hopefully* we'll have less of a battle this fall/winter when it comes to putting on outerwear! We HEART the Moto Jacket by Jennuine Design! 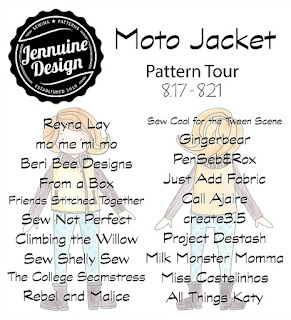 If you get at chance, go ahead and check out all these other wonderful bloggers participating in the Jennuine Design Moto Jacket Tour! Last Friday, Lil' Miss took part in the Discovery Place Kids, Countdown to Kindergarten! Alongside her best bud, Connor, Lil' Miss played the night away! She enjoyed running from center to center discovering all that the museum has to offer. She played in the fire truck, the veterinarian center, the grocery store, water play and she even "changed a tire" in the car care center. 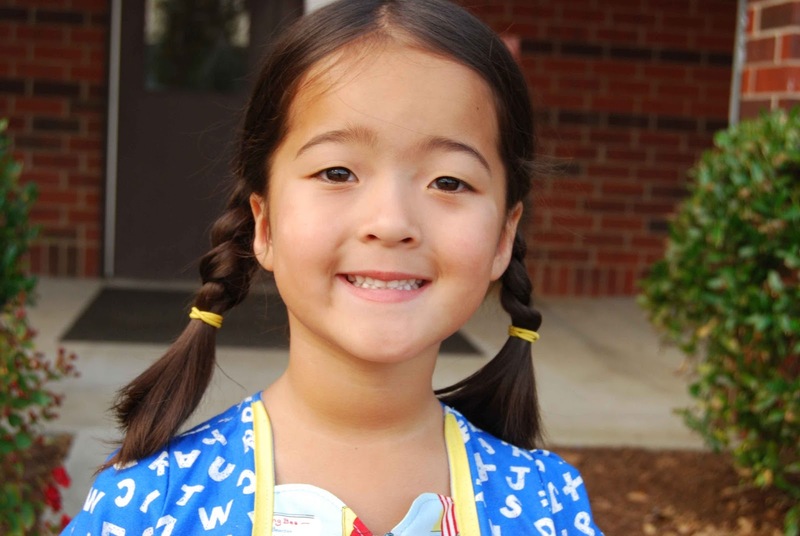 Besides the regular DPK areas, Lil' Miss also learned to navigate the cafeteria line and listen to a story. There were even "princesses" on hand to meet and greet the upcoming kindergarteners! Katy can't wait to start Kindergarten! 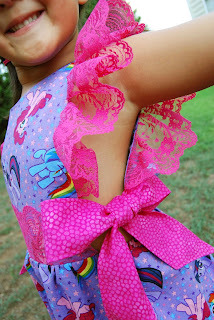 I was fortunate enough to test another pattern by Made for Mermaids. This time, the Hampton Romper, Top and Dress. 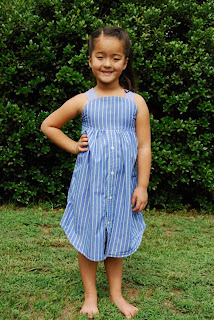 The Hampton Romper, Top and Dress is a, "....stunning, vintage, southern style pattern..." that can be done as either a top, dress or romper (with four pant lengths). -The Hampton Romper, Top and Dress comes in sizes 1/2-8. 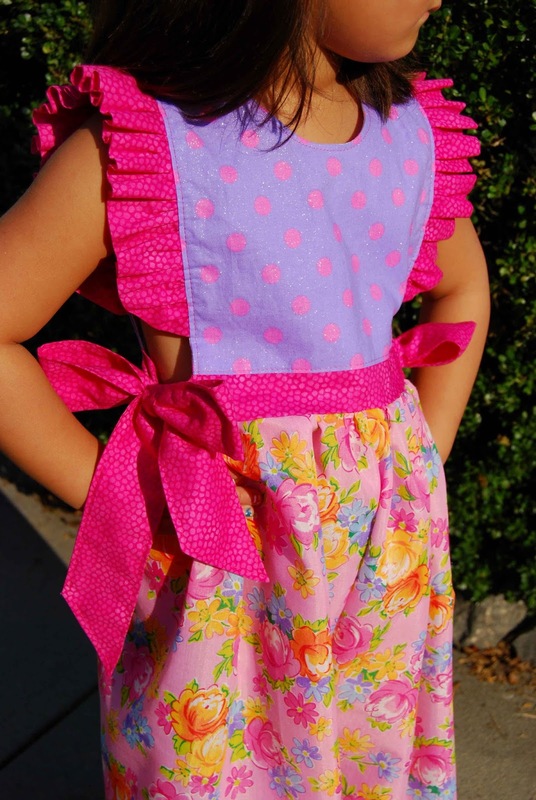 -The Hampton Romper, Top and Dress can be sewn as a dress, a top, or pants romper (with four pant length options). 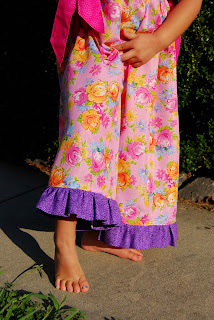 -There are four pant lengths to choose from for the Hampton Romper- Bubble, Shorts, Capris or Pants. 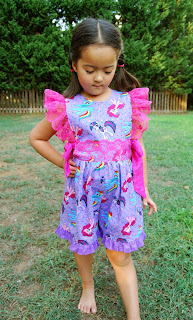 -The Hampton Romper, Top and Dress features ruffle flutters that can be done in fabric, lace and/or curved or squared. -The Hampton Romper, Top and Dress features a single button back closure. -The Hampton Romper, Top and Dress PDF sewing pattern includes a size chart, fabric requirements chart and measurement chart. I sewed up two rompers during testing. Both rompers were size six, based on the included sizing chart. Sometimes, when you test a pattern, you end up sewing more than one garment due to feedback and suggestions (and in the journey to releasing the best pattern possible). 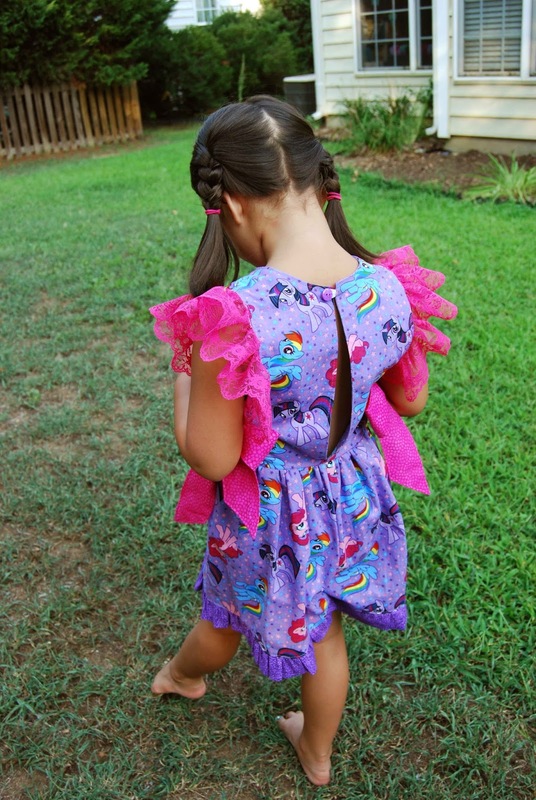 I love that Megan, the brains and talent behind Made for Mermaids listens to her testers and tweaks and works to get the pattern JUST right... Thank you, Megan! Now, I'm going to be really honest and say that the Hampton Romper, Top and Dress is not really my style. However, part of the reason I like to test sewing patterns is the fact that it broadens my horizons and exposes me to different styles and teaches me knew things. 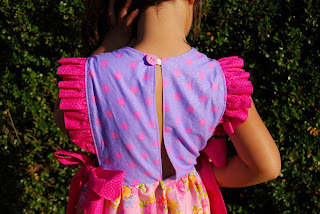 The Hampton Romper, Top and Dress did just that and I love the end result! 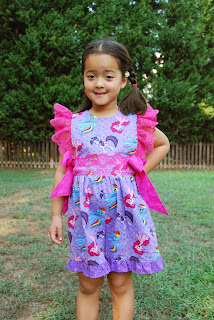 Like all Made for Mermaids PDF sewing patterns, the instructions were easy to follow and each step included clear photographs to aid in the understanding off the pattern. The Hampton Romper, Top and Dress has a nice, clean, lined bodice. I love when the inside looks just as neat as the outside! 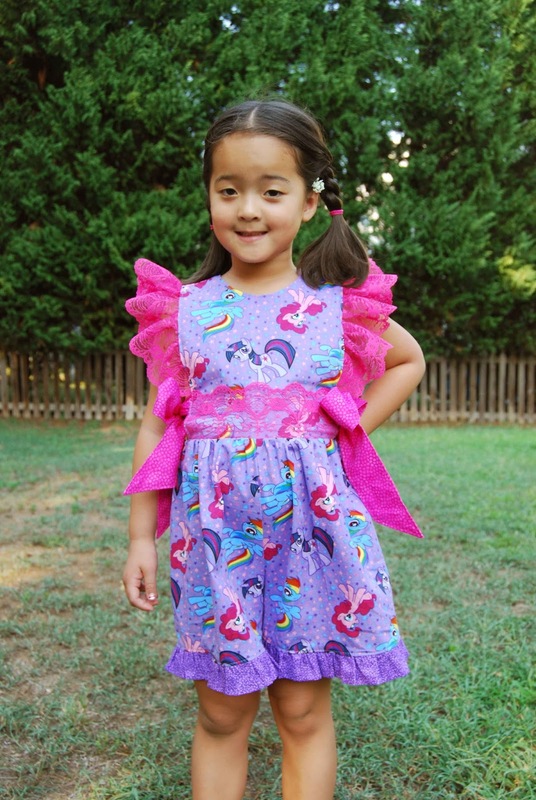 Thank you, Megan, for another wonderful Made for Mermaids pattern! Thank you, Molly of Noble Dixie Clothing for the inspiration. The Hampton Romper, Top and Dress is gorgeous! 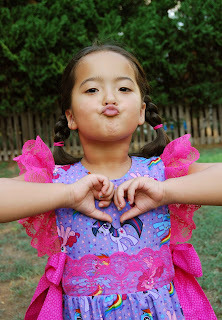 Big, squishy heart love for the Hampton Romper, Top and Dress! We're big Aardman Animation fans, here in the Jones household! So, when we found out that Shaun the Sheep was going to be appearing in his own feature-length film, we made an afternoon of it. Lil' Miss got all dressed up (oh, wait- that's EVERYday!) 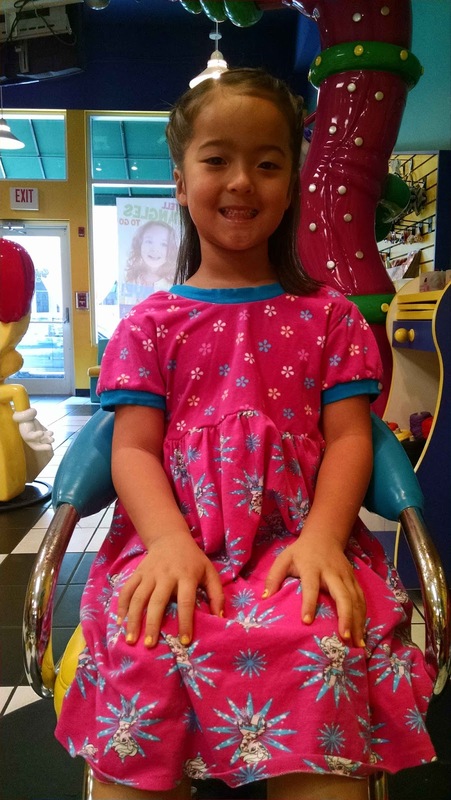 and even wanted to do her own hair. When she walked out of the bathroom, she told me, "Look, Mom! I fluffed my hair! Now it's just like a sheep!" 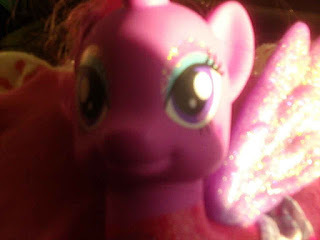 (Basically, she teased her hair- minus the hairspray.) Sheep.... the next big fashion trend...! It's B- EWE-tiful....! Ha!